Pay on the door only please, DO NOT PAY ON LINE. Booking for catering purposes. 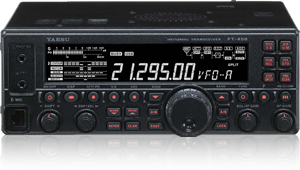 Yaesu UK have donated a brand new FT-450AT Transceiver as first prize in the raffle. There will be many more prizes, so watch this space! ML&S have donated a Wouxun 2m Handie. has been donated by Nevada. ICOM have donated an IC-V80E VHF FM transceiver. The RSGB has donated a number of books including the massive 2010 ARRL Handbook. There will be some further items generously donated by CDXC members (including some chocolate!). The cost is a modest £10 (please DO NOT pay On Line but pay on the day only) and will get you a super BBQ meal buffet style. The accompanying Social is a great opportunity to meet new friends and catch up with a lot of old ones too if you have attended before. Our President's QTH is a very welcoming and informal setting. Members can attend only the AGM if they so wish.